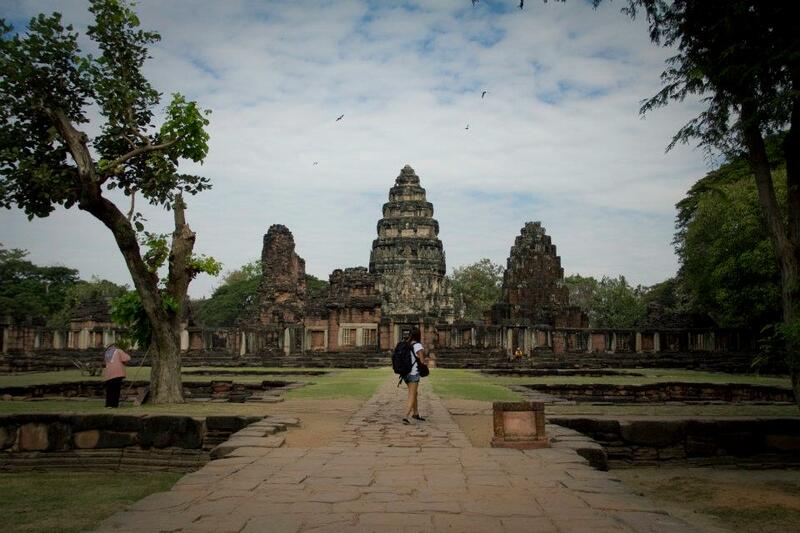 The first thing that hits you about Phimai is how small it is – possibly the smallest town I have ever seen. I could probably walk its entire circumference in an hour. Central to Phimai is Prasat Hin Phimai Historical Park, home to one of the most important Mahayana Buddhist temples in Thailand. Say Wat? According to my trusty Lonely Planet guidebook (Which I read almost every night while Daniel watched TV, and still it never seemed to run out of content), nobody knows exactly why these massive sandstone structures were built in this exact location, but they were constructed between the 10th and 12th century, predating the Angkor Wat. Historians believe that their architectural style shares a resemblance with Angkorean buildings, though this may be purely hopeful conjecture. The nice thing about pseudo-Angkorean temples is that you escape the hoards of tourists descending into every frame. The only other people besides us were schoolchildren tasked with sketching the ruins, a group of monks, and a veritable army of cleaners ensuring that stray leaves were swept into neat piles. We had a good time clambering across the ruins, up and down dusty stone stairs, with pretty much the whole place to ourselves. The bus ride back to Korat, from which we would catch another bus to Pak Chong, is in itself worth a mention. I grew up in a time when non air-conditioned buses still plied the streets regularly, but this was a on whole other level of rickety, with a wooden planked floor, a roof that looked very much like aluminum, and small dusty ceiling fans rotating from it. The din was so loud I gave up on earphones altogether. Staring out at endless plantations lining each side of a dirt road, suddenly I felt a lot more grateful for my vacation. When Daniel and I went to Thailand, admittedly we were a bit fed up with Singapore and wanted to get away from city life. But for the soldier in army fatigues who sat beside me on the bus, or the country folk shuttling from one job to another alighting in what seemed like the middle of nowhere, there is no getting away from anything at all.